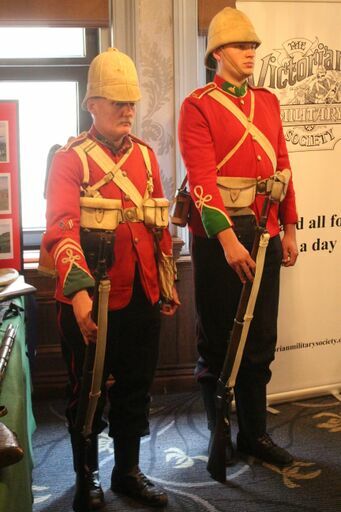 Our first event of 2019 was the annual Victorian Military Society Seminar – returning to our roots as the living history arm of the VMS. 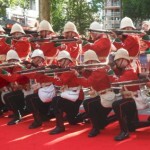 The Victorian Military Society has been running an annual full day lecture seminar in central London for the last few years. 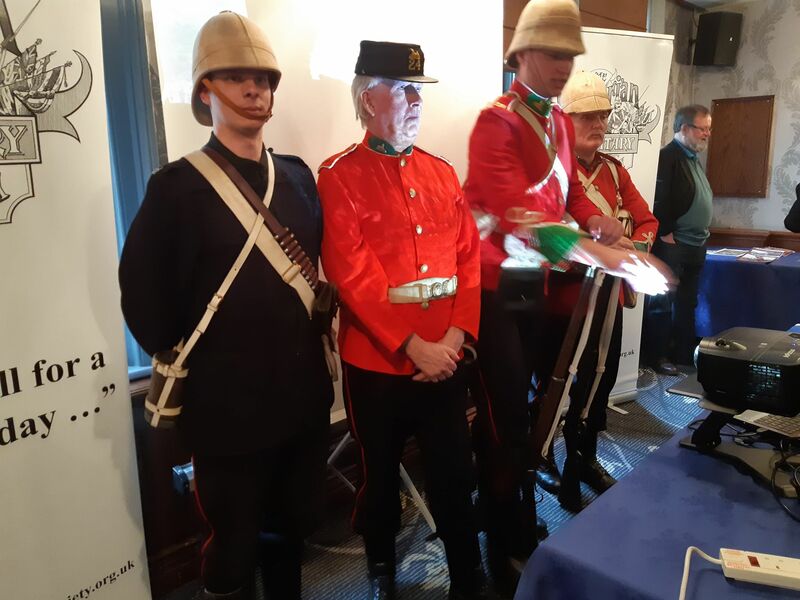 We have supported the activities with a range of displays and talks appropriate to the subject matter from the Boer War, through the fictional Battle of Dorking and the 2019 seminar was tied into the 140th anniversary of the Zulu War. 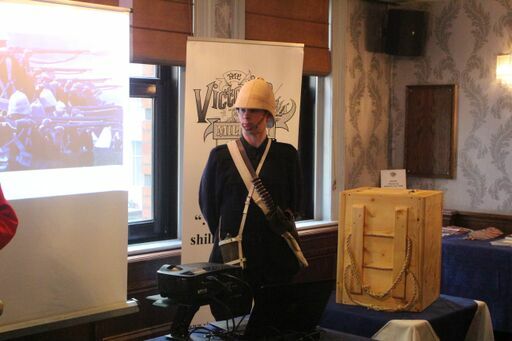 This was the first complete sell out event (reflecting perhaps the public interested in that war) and also attracted a number of big hitters from the AZW community. Ian Knight opened the running order with a talk on how the War has been commemorated since 1979 (and paid some nice tributes to what the group has done), Professor John Laband followed with a lecture on the role of the Swazis in the war, Professor Ian Beckett did a nice synopsis of his most recent book on Rorkes Drift and iSandlwana and Dr Christopher Brice spoke on Sir Garnet Wolseley and his contributions. 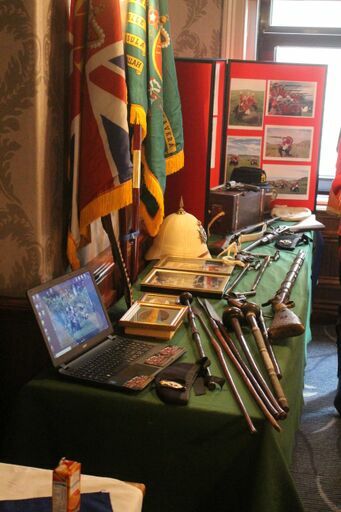 We put out a display of Zulu and British weapons from the period – including some fairly rare revolvers, a Volunteer Swinburn – Henry carbine and some unusual Zulu items, along with recovered battlefield relics, one of Cetewayo’s Zulu War medallions and a number of other rare bits and pieces. 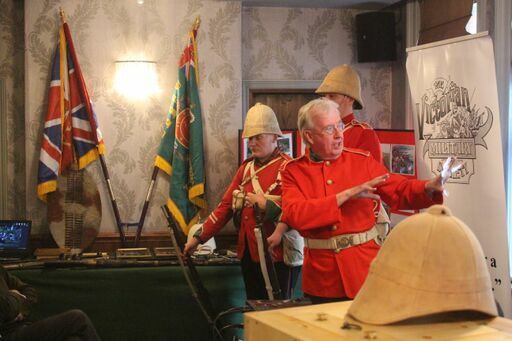 Our other contribution to the event was a 30 minute talk on the kit, equipment and weapons of the British soldier followed by a walk through the history of the Diehards and more recently A Company, 24th Foot’s involvement with the Zulu nation and our 140th anniversary trip. 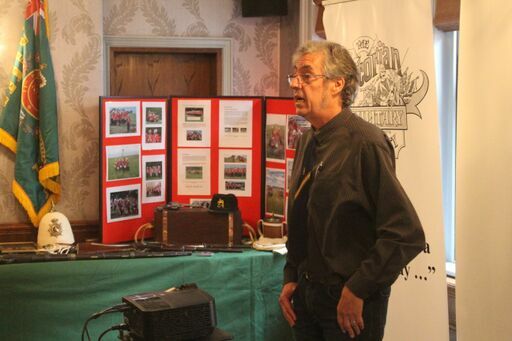 (Via powerpoint presentation) – all very well received by an enthusiastic and knowledgeable audience.